It may seem hard to believe with the weather recently, but spring is on it’s way. I already have some tulips coming up in the planter at the front door. Spring is a wonderful time of year, but with spring comes spring cleaning. I actually enjoy the thought of spring cleaning. There is something about the thought of being organized and starting a season off on the right (clean) foot that is satisfying. However, I find that when I start spring cleaning, I am usually surprised by how much work it is. Of course, there are some tasks that you should leave for the spring. For example, cleaning your gutters is not pleasant in the cold of the winter. Even re-organizing the garage can leave you with a chill. There are a lot of things that you can start on in the late winter to give yourself a kick-start, and make the big task easier. Many households take spring cleaning as an opportunity to repaint, hang photographs and picture frames, and re-organize art. Before doing these things, wipe down your walls with a gentle solution. Lots of dust settles on your walls over time, and doing this ahead of time will make your spring cleaning a lot easier. Spring cleaning and organizing is much easier when you have less clutter. If you plan to re-organize your closet and drawers, take the opportunity to go through your clothing and sort it into “keep”, “discard” and “donate” piles. Trends change over time, and so does our size and our preferences. Donate the items you no longer want to keep. 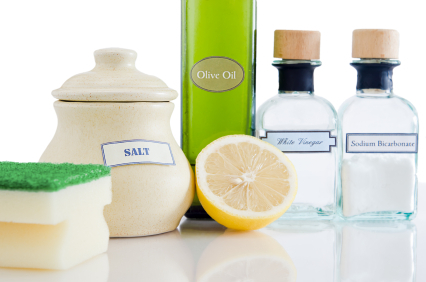 Removing all of the ingredients from your pantry to clean it out and give it a wipe down can be very time consuming. To the same effect of cleaning out your closet, having less food will help make this job easier. Each winter, I go through my pantry and make an inventory on a piece of paper, documenting each and every ingredient I have. I write down how much of it I have, and then find recipes so that I can use up the ingredients that were just sitting there. If the ingredient stays in my pantry for longer than two months after having done this, and it’s not crossed off of my “inventory” list, I donate it to the Food Bank. This also helps keep my grocery spending down, as I am using up ingredients that I already have instead of going to buy new ones. Many times, I’d forgotten that I had the item on hand already and purchased another. There’s no reason that you shouldn’t be doing this year round. Ensuring that your appliances (large and small) are in good condition and are well maintained helps them last longer, which can save you money in the long run. I usually empty my crumb tray in my toaster, and then clean it inside and out. I run the “clean” cycle on my oven, clean the lint out of the various hiding places on my dryer, and ensure my washing machine is build-up free. Since these appliances are indoors and easily accessible, they should be easy to clean in the winter. When the sun starts coming out more, it will be difficult to stay indoors checking things off of your to-do list. Try to finish up any indoor projects that you had on the go throughout the winter to make your spring-cleaning foray a little less straining. Maybe you were painting a wall or installing some shelving; doing these things during the winter will hep free up your time to do outdoor activities and projects in the spring. When do you start on spring cleaning? Please do not remind me. These are things I know that have to be done but really not looking forward to it. Hopefully I can sweet talk my wife into helping me out a little more during the spring cleaning. So happy to see spring posts, finally! The Food Bank/inventory idea is really great. Will try this starting now! We already finished ours. It was an amazing feeling afterwards. Welcoming the fresh breeze and the sun.